It's 2050, Earth is dying, and colonizing Mars is the only alternative to obliteration. Bowman and her crew have made this journey to investigate what went wrong with the malfunctioning Mars Terraforming Project, and to repair it. But what happens when they get there is far more terrifying than anyone could have guessed: a crash-landing leaves them without scientific, communication or escape equipment, and causes their military mapping and exploration robot to malfunction into an enemy, relentlessly dedicated to breaking the team down. Defying orders from Houston, Bowman refuses to leave Gallagher (VAL KILMER), with whom she shares an intense emotional bond, and the rest of the crew, and instead attempts to guide them back from above. all: Mars may be barren, but it's not uninhabited. Val Kilmer ("Heat," "The Prince of Egypt," "Tombstone"), Carrie-Anne Moss ("The Matrix"), TOM SIZEMORE ("Saving Private Ryan"), BENJAMIN BRATT ("Miss Congeniality"), SIMON BAKER ("L.A. Confidential") and TERENCE STAMP ("The Limey") star in Red Planet an epic romantic adventure about one crew's intense struggle for survival against the most extreme odds imaginable. It is executive produced by Charles J.D. Schlissel ("While You Were Sleeping") and Andrew Mason ("The Matrix"), from a story by Chuck Pfarrer ("Darkman"), screenplay by Chuck Pfarrer and Jonathan Lemkin ("The Devil's Advocate"). Music is by Graeme Revell ("The Insider"). The talented behind-the-scenes team is led by director of photography Peter Suschitzky ("The Man In the Iron Mask," "The Empire Strikes Back"), production designer Owen Paterson ("The Matrix"), and costume designer Kym Barrett ("The Matrix," "Three Kings"). The film is edited by Robert K. Lambert, A.C.E. ("Three Kings") and Dallas S. Puett ("Deep Blue Sea"). Red Planet explores the alien landscapes of Mars as never before. "The audience is going to be experiencing Mars in a totally new way," says producer Mark Canton. "This film has a velocity to it, and a totally unique look, sound and feel. Both the getting there and the being there are filled with a real energy." Realism in all details was key for the filmmakers and for director Antony Hoffman, who prepared with extensive technical research about Mars and about space travel. "I looked at a lot of photographs from NASA," says Hoffman, 'lust to see how the light behaves in that atmosphere. I wanted it to be as real and intimate as possible, not a fantasy." To enhance the visuals for the film, visual effects supervisor Jeffrey A. Okun enlisted leading effects companies such as Cinesite Inc., whose groundbreaking work was last seen in "Deep Blue Sea." The filmmakers brought on Academy Award winner Dane Davis ("The Matrix") and his team to create sounds for space and the planet Mars that have never before been heard. "We have key sound crew from 'The Matrix,' the costume and production designer from 'The Matrix,' and a director with a completely unique style," says producer Canton. "The feeling you will have when you're on Mars will be unlike anything you've ever felt or seen." Bruce Berman, who acquired the project for Village Roadshow, agrees. "We are trying to create a whole new experience with this film," says Berman. 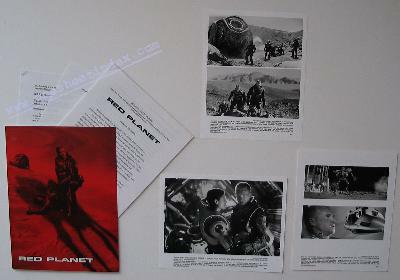 Red Planet is distributed by Warner Bros. Pictures and, in select territories, by Village Roadshow Pictures. other planets for its future. The scientific community has created the Mars Terraforming Project whose goal is to seed Mars with oxygen-producing algae that will generate an oxygen-rich environment capable of sustaining human life. But when oxygen readings suddenly cease transmitting from the planet, a skilled team of specialists must make an emergency mission to land on Mars and attempt to salvage what could be mankind's only hope for survival. Producer Canton sees the film as "as a movie that crosses genres. It's science fiction, but it's also an adventure with romance. And the film is unique in that it has a solid basis in science fact." Continues Canton, "It's a smart movie that posits the questions what if man fails to do the things necessary to live on Earth; what if we have to go some place else; what if that place is Mars; what if there are things on Mars that we don't know about? What if we need to get the information to survive on Mars, and what if we can't? The story also has an intelligent side which debates the values of philosophy and theology and religion and science, or lack of all of those as well. This is not a movie that you can put into a small space." "It's a contemporary story with a timeless theme, man versus nature, that just happens to be set in the future, where the stakes are higher," explains director Hoffman. Adds producer Jorge Saralegui, "This is a film about survival - not just the survival of the species but also this group of astronauts who must survive in the most alien of environments without the benefit of technology. In fact, that technology has turned against them, so it's they who are completely alone and vulnerable." Val Kilmer agrees, "This is the best Mars movie because it's science fact. It feels true even though the circumstances are extraordinary. It also celebrates man's ingenuity and asks the big questions about who we are, and what's going to happen to us." For Kilmer, who has played some of the most prominent icons in modern film, including Batman, Jim Morrison and Doc Holiday, the role of Mechanical Systems Engineer Robby Gallagher was a welcome return to the character roles on which he built his career. "Robby is basically the space janitor," says Kilmer. "This is a science expedition but he's not a scientist; he's a maintenance man -. for the ship as well as the crew. He doesn't have personal ambition. He doesn't understand life in any other way. He's just there to serve the ship and the others." "Val plays the reluctant hero," explains producer Saralegui. "Gallagher is content to remain in the background until he has no choice but to act."